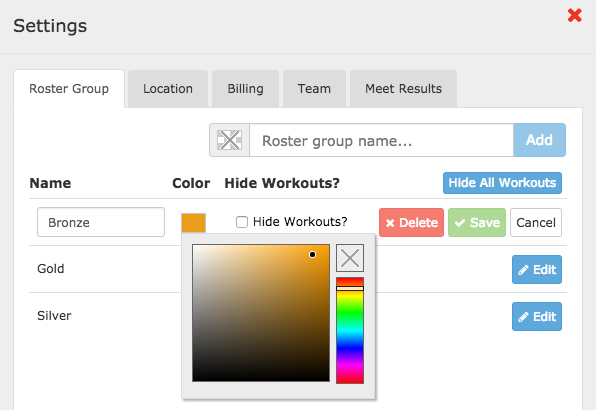 When you initially sign up for SwimOffice Pro with Coaching Tools, there are a few tasks you need to do to get your team set up and running—set roster group colors, designate coaches, and build custom tags and swim attributes. All the below steps require Head Coach level access (If you do not have Head Coach access please ask your head coach to add you. You will need to assign different colors to your Roster Groups to distinguish between them in the Practice Calendar. In the side menu click Coaching Tools > Practice Calendar. Click Edit by a Group. If you want to hide workouts from those in a certain roster group, check the Hide Workouts? checkbox. Click the box under Color. Choose your desired color, then double click Save. Repeat for all other Groups for which you will run practices. 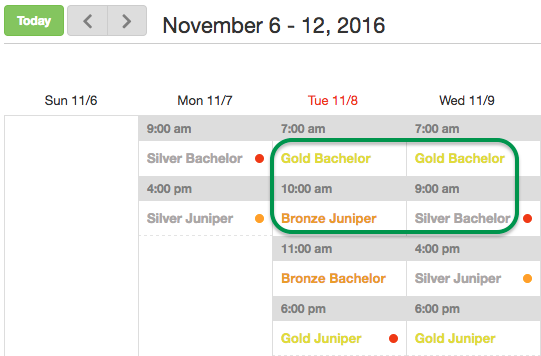 You will then see those colors on the web and mobile app practice calendar. Add everyone who will perform administrative tasks, whether recording video, writing workouts, or communicating with membership. To do these steps you must have Superuser access. If you do not have this, please speak to a Superuser on your team about either giving you that access or adding the users for you. Search for someone you want to make a Coaching Tools user, AKA a Coach. Videographers can be any admin level, including Not an Admin, while Assistant and Head Coaches must be at least an Email/Print/Calendar admin level. You can hover over the icon by a user’s name to see their admin level. Click Add by their name. They will move to the Selected Coaches list at the bottom (or on the right if you expanded the screen). Pick their role from the dropdown list. Repeat for all remaining users you want to add. Click Remove by a name on the right if you want to remove their Coaching Tools admin access. Click Update in the upper right. 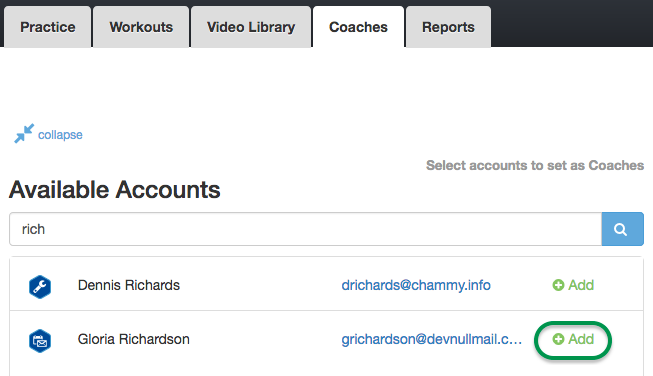 If you added a Not-an-Admin user and set their coach level to Head or Assistant Coach, you will get a warning that it will set their admin level to Email/Print/Calendar. Click OK to accept, or else Cancel and make them a Videographer, then Update again. If you need to add people who don’t exist yet in SwimOffice, you can do this in Account/Member Admin. See Add/Edit Account to learn how. 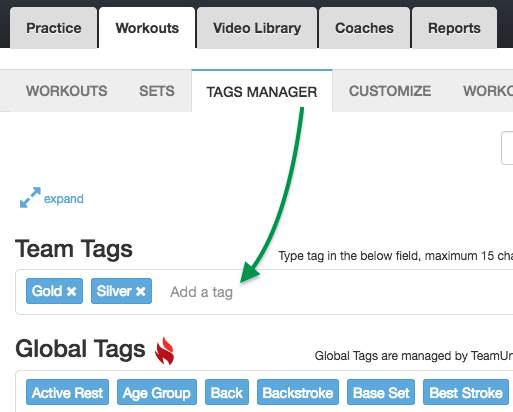 Tags are used to label workouts and sets, and to filter workouts by tag. Coaching Tools come with a predefined set of non-modifiable Global Tags, but since each team is different, we encourage you to add your own Team Tags. Click the Workouts > TAGS MANAGER tabs. Under Team Tags click Add a tag. Type a tag name and press Enter. To edit a tag, click the name, edit it, and click Save. To delete a tag, click the x by its name. When you add Swims to Sets, each Swim has several attributes. In addition to the default non-modifiable (grey) attributes supplied with Coaching Tools, you can add your own Strokes, Set Types and Swim Descriptions (Race Pace and Energy Level are not modifiable). 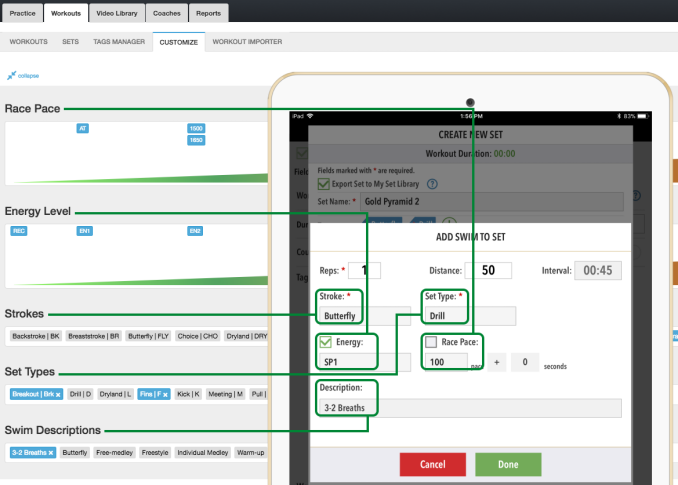 The below illustration shows where each attribute is used in a Swim in the mobile app. Click the Workouts > CUSTOMIZE tabs. Under the desired attribute, click Add new item. Type the name, and for Strokes and Set Types, the abbreviation (up to three letters) and click Save. The number of characters allowed for each appears on the right. To edit an attribute, click the name, edit it, and click Save. To delete an attribute, click the x by the name. If you have used Hy-Tek's Workout Manager (part of Team Manager™ Gold) and want to import some or all of your workouts into Coaching Tools, follow these steps. Export your desired workouts from Workout Manager. In SwimOffice, click Workouts > WORKOUT IMPORTER. Click Choose File or Browse, then find the .wk3 file and double click it. Or drag the file onto the Upload dialog. Click Upload. Once the file is uploaded and processed, click the red X to close and you will see all the workouts listed. Click a workout to view, then click the pencil to edit the name. Use the typical Customize buttons and Search function to narrow down your list. You can also click the CUSTOMIZATIONS link to review and edit what Strokes and types are mapped to Coaching Tools equivalents once you import. Make sure to click Save after changing anything, and click the WORKOUTS link to return to the list. Workout Preview — See what the workout will look like once imported into Coaching Tools. 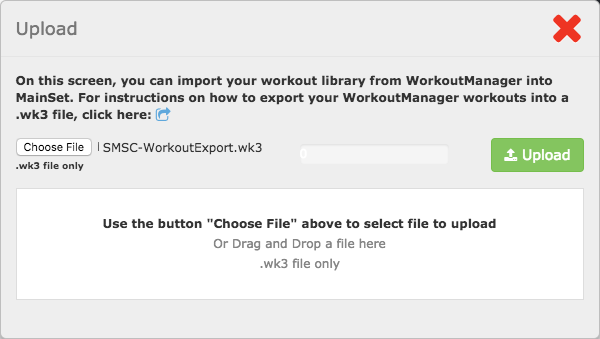 Import — Import selected workouts. Import All — Import ALL workouts listed regardless of selection. Delete — Delete selected workouts. Delete All — Delete ALL workouts listed regardless of selection. Once you are satisfied with some or all of the workouts, select the ones you want to pull into your Coaching Tools workout library and click Actions > Import or Import All. 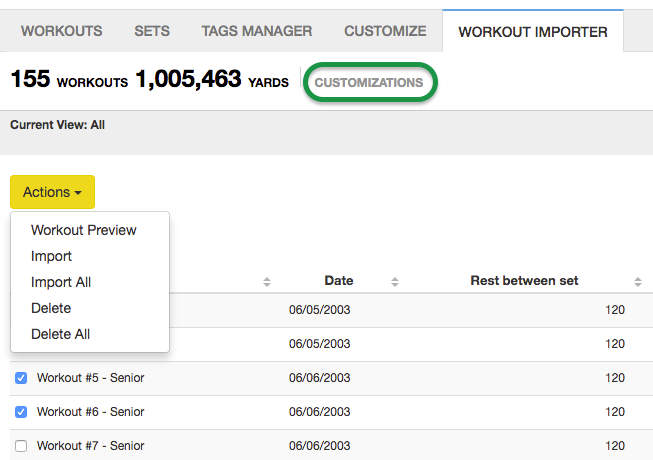 Your selected workouts will now appear in your Coaching Tools Workouts library. With your initial setup complete, we'll cover navigation tools and techniques.